When high school and middle school science teachers engage in extracurricular research work, their students benefit. That's the result of a new study published in Science last week by researchers at Columbia University. In addition, they found that such extracurricular research work can also bring economic benefits to schools and communities. 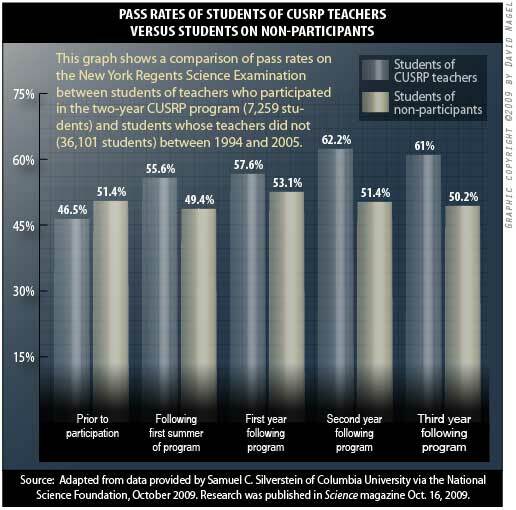 The research, funded in part by the National Science Foundation, focused on middle school and high school teachers in New York, who engaged in a program called the Columbia University Summer Research Program for Secondary School Science Teachers (CUSRP). The research team, led by Samuel C. Silverstein, evaluated the performance of their students over the course of several years following the completion of the program. They found a definite, statistically significant benefit for the students of the teachers who participated in the program, but only after a delay of a couple years. This delay, Silverstein said, may explain why similar benefits have not been reported from other science teacher summer research programs: Evaluations of the results were too short-term. He said many such programs may have been more successful than previously thought; there just wasn't the proper evaluation to determine the actual, longer-term success of the programs. "You'll notice in the Science paper," he said, "that the data only become statistically significant in the third and fourth years after teachers complete the program. Now we see incremental differences in the first and second year after entering the program, and the third and fourth years after entering the program are where the statistically significant outcome data are found." Silverstein pointed out that the benefits did not arise from specific knowledge gained by participating teachers but rather by the "generic things about dong science" that the teachers picked up in their experiences, "about the importance of doing hands-on science, about the importance of understanding the technologies of science so that you can actually ask yourself, 'Gee, if I had to solve that question or problem, what technologies would I use? How would I prove that?' It has to be that they learned a new way of responding to students." The researchers also explored the economic benefits of the program and estimated that for every dollar spent on the program by sponsors, the New York Department of Education receives back $1.14 within four years through a combination of "increased teacher retention and decreased need for students to repeat coursework," according to NSF. Further, economic benefits may also be realized through increased graduation rates. The full paper, "Teachers' Participation in Research Programs Improves Their Students' Achievement in Science," can be accessed by Science subscribers and AAAS members here.